Kia ora koutou katoa, the Wellington Home Birth Association invites you to join us at the 2018 Home Birth Aotearoa National Hui “Unity is Strength”, as we come together on this occasion we would like you to bring with you, your thoughts and ideas on how we can unite to become stronger in the future. If we strengthen unity and boost teamwork and communication, incredible things can happen. Individually we are just a drop, but together we become an ocean, working as a team who share the same passion we can reduce the workload and increase success. 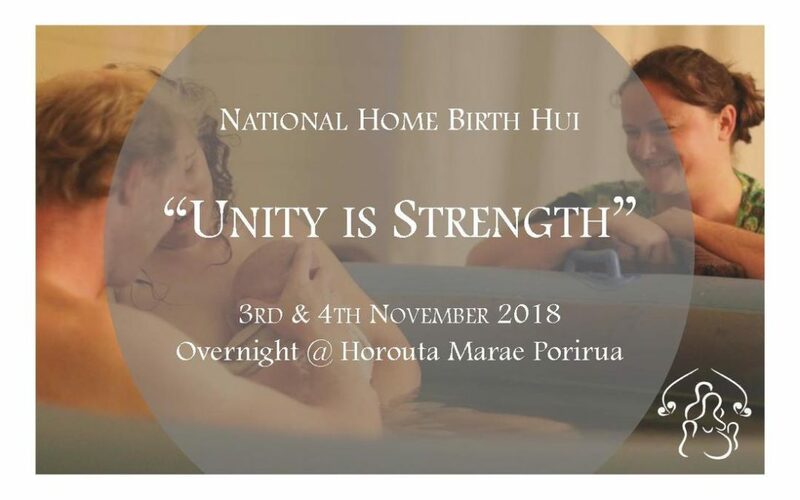 The national hui is held in spring each year and is a gathering of all homebirth associations and support groups, and anyone interested in homebirth. Attending hui is an opportunity for all, to share our regional issues and to reflect on what we are trying to achieve as a national organisation. Successes are celebrated, issues are discussed, plans are made and knowledge is shared. The AGM is held, providing a forum to hear and approve board and financial reports and review the Strategic Plan. We are confident participants will leave hui feeling inspired and energised by each other. We have opted for a Marae sleep over, so we can gather in a relaxed home like setting, catching up with old and new friends over a cuppa. Good day. I really would love to attend this Home birth Hui in Wellington in November. I am a year 3 student midwife. Registration is closed, but is there a way that i may attend still. Another student Gaye Davis are also interested to join me. hi Maggie – I will forward your request on to the organising team.